Ultrabead Bead filters are closed (pressure) vessels filled with millions of small plastic beads. These beads float and therefore provide a means of mechanical filtration and the enormous surface of these beads provides the biological filtration. Ultrabead Bead Filter Mechanical filtration: the beads float in a closed vessel and are packed very close to each other. The pressure of the pump makes the water flow upward through the beads. The small dirt particles will stick in the bead pack. The longer the filter is active, the more bio film there will be around the beads and therefore smaller particles can be filtered. Ultrabead Bead Filter Biological filtration: the specific surface of the beads is about 1600m2 per m3(6 times more than a blue Japanese Mat), so the bio film layer around the beads extremely useful for nitrifying bacteria that consume vast amounts of ammonia and nitrites. 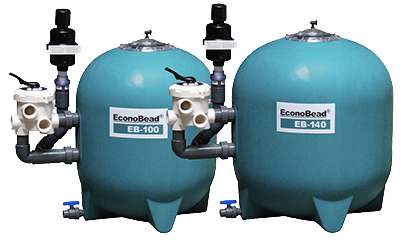 The in and output system of the Ultrabead Bead Filter has laterals (slotted pipe) to keep the beads inside the filter and therefore we need a pre-filter to prevent the possibility of large solids (string algae, pine needles, leaves and fish waste) coming in from a bottom drain or submersible pump. We strongly recommend the use of the Ultrasieve III filter in before the Ultrabead Bead Filter. UltraBead filters are constructed from high quality fibreglass conforming drink water standards so they are completely save for your fish. You can now use low wattage pumps with the Ultrabead Filter, Ultrabead have introduced a bypass for Europe’s best selling beadfilter ! Installing the UltraBead Low Pressure Bypass Kit allows the use of more economical pumps. Due to a very compact bypass-system, the multi-way valve is completely unused during filtering as the water flows directly into the filter and also leaves the filter in a direct line. This action results in at least 30% less pressure loss (depending on the type of pump). The bypass system is very easy to install on all UltraBead models, using the unions supplied. Connection: 63mm. Assures a completely automatic backwash process for UltraBead filters! Is suitable for all UltraBead types. Installation takes only a few minutes. Controls blower and circulation pump automatically. Standard with a weekly timer, but frequency and length of the backwash process can be adjusted as required. In addition, one push on the button starts an extra cycle immediately. Can also be set to CIRCULATE and CLOSED (valve closed). Choice of 3 languages for the display: Dutch, German or English. 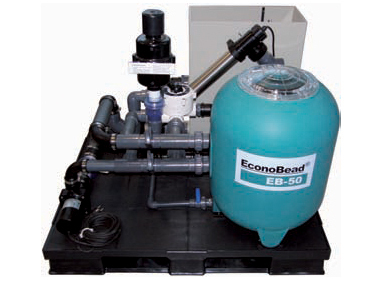 Unique to the UK market, a complete plug and play filter installation consisting of Econobead EB 50 or Econobead EB 60 with by pass, Midisieve, 40 watt power UV T5 and Forza 15000 pump. All these products are ready installed on a polymer pallet. This only needs 3 connections to the pond system. Pallet size is 100 cm x 120 cm x 85 cm High. The water enters the Ultrasieve Midi via the Ultraskim or bottom drain and passes through the “auto-adjustable” dam and will go upwards and fall over the weir on to the Stainless Steel sieve-bend.